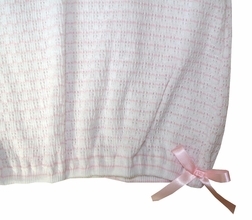 Home > Babies & Infants > Baby Clothing, Gowns & Layettes > INFANT GIRLS > Girl's Pink And White Layette Baby Infant Gown By Paty, Inc.
Sweet white with little pink stripes cotton pointelle gown for babies. 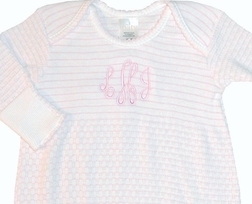 The front is perfect for monogramming and the bottom is embellished with light pink satin ribbon. Precious for girls.